As for my own bath—aka The Bathroom of Doom—I must thank you all very much for your excellent suggestions on how to de-doomify it. I have to say, the picture I included of it was really spectacularly crappy, so you can at least take heart that it isn't quite as awful as you might be imagining it to be. So far in the de-doomifying process, I have.....uh, well I've bought a stripey bathmat and that's about it. Big progress, eh? But I have plans, Internet, don't you worry. In fact, it's official: now that the kitchen is almost unpacked and the glasses and plates have been stacked and organized according to size, morale has been boosted in the Nothing But Bonfires household, which is a beautiful thing indeed. It's just a crappy iPhone picture but I swear to god, looking at this brings my heartrate down and slows my breathing to normal. You have to share how your dad called her Bay-ONTZ! Best. story. ever. I've said it once, I'll say it again: you've got a face for TV. Which, by the way, is MUCH better than a face for radio or voice-overs. I totally know what you mean; if my place is in disorder, I can get physically ill. 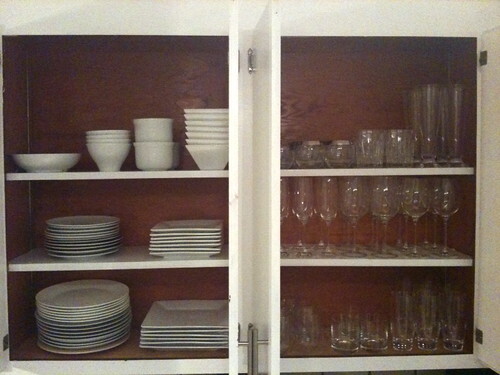 Although I have opaque cabinet doors, so I don't have to worry quite as much about how my dishes look inside of them. Which is good, because I have a toddler, so there's quite of bit of plasticware in there with my Peacock Fiesta - not a pretty picture. My kitchen cabinets look exactly the opposite of this. One of them actually holds pages from various old manuscripts I wrote before getting published. Open it, and three times out of four a stack of yellowed papers will fall on your head. Yes, my kitchen is a health hazard. That china cupboard is so pretty I sure it can calm anyone's nerves! Although...I suppose you've got that bathroom- so that makes us even. Also, my cupboards only look like this because I've just moved in. Well, that and a slight touch of OCD. Holly, you are such a nerd. Oh Leslie, we have those, don't worry (though it's more like souvenir cups from Yankees games) but they're in a different cupboard: one where we put the crap we never use but can't bear to part with. You've already organized the kitchen cabinets? Wow, you move fast! Too weird -- we have been calling it "Bed, Bath and Beyonce" for years. Hi Holly and Sean! Long time no electronic contact. Okay, those cabinets are both beautiful and somewhat disturbing. Do you always keep them that tidy? (Stacked in order of height? OMG that's so anally OCD-ily wonderful! I think I love you.